In a related post that I’ve posted before this, I have written on the classical Japanese literature masterpiece known as “The Tale of Genji” (源氏物語, Genji Monogatari), which is frequently recognized as the first novel ever to be written in this world. Indeed, little do many know that the first ever novel in this world is actually a Japanese classical work, dating back to over 1000 years ago. However, do we really know the great lady (yes, a lady, and not a man) behind this famous Japanese masterpiece? Murasaki Shikibu (紫式部), or commonly known as Lady Murasaki in English, is the renowned writer of the classical Japanese work “The Tale of Genji.” Many may be surprised at the fact that the first ever novel to be written in this whole world is actually by a lady, and not a man. 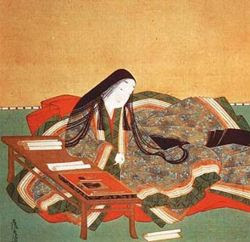 Born in around the year 973, during the Heian Period (平安時代, Heian–jidai) (794 – 1185 A.D.) of imperial Japan, Murasaki was a famous Japanese poet and novelist who served as a lady-in-waiting in the Japanese imperial court. Murasaki Shikibu was born in Kyoto (京都), the capital of Japan during the Heian Period. She was born into the Fujiwara clan (藤原氏), which was the clan that was controlling the entire administration and government of Japan during the Heian era. 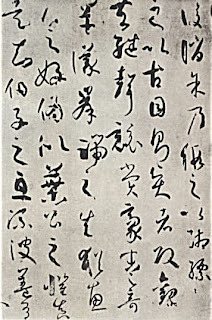 Her father was Fujiwara no Tametoki (藤原の為時), who was a famous poet, scholar in the Chinese language and culture, as well as a governor of a few provinces in Japan. Fujiwara no Tametoki served as governor of Harima Province (播磨), which is presently within Hyogo Prefecture (兵庫県), as well as governor of Echigo Province (越後), presently part of Niigata Prefecture (新潟県). It was during the time when he served as governor of Echizen Province (越前) (presently part of Fukui Prefecture (福井県)) when Murasaki Shikibu was born. Murasaki Shikibu was not her real name, however. According to her diary, she was called “Murasaki” (紫) in the imperial court, named after a character in “The Tale of Genji.” “Murasaki” means “purple” or “violet” in Japanese. “Shikibu” was the name used to refer to her with respect to her father, as it refers to her father’s position in the Bureau of Ceremony (式部省, shikibu-shou). Some thought that her real name was Fujiwara Takako (藤原孝子), but this has not been solidly proven. During the Heian Period, it was customary for married couples to live separately, whereby children were raised by the mother and her family. In Murasaki’s case, her mother died when she was still very young, thus her father went against the accepted customs of that time by raising her himself. She frequently followed her father when he went on official trips around the provinces of Japan. 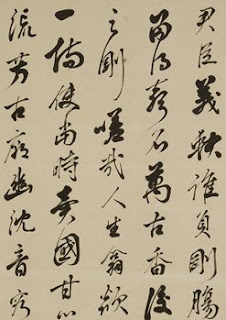 Hence, during the Heian Period, boys learned the kanji script and classical Chinese literature while girls learned the hiragana and katakana scripts along with Japanese poetry. Murasaki’s father, however, raised her in a manner which was also against the Japanese customs of education at that time. 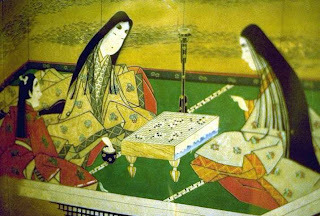 Murasaki, being a girl, was given a boy’s education. Her father taught her, along with her brother, the kanji script, Mandarin Chinese and classical Chinese literature. Murasaki was a fast learner and she picked up more quickly compared to her brother. This often caused her father to lament over her being born a girl. “If only you were a boy, how happy I should be!” Murasaki’s father frequently told her. Murasaki kept her knowledge of Chinese and the kanji script a secret, as she did not want to be viewed as being unwomanly. Nevertheless, she later gave Empress Akiko, whom she would serve later on in life, lessons in reading Chinese poetry and writing. Murasaki was married in her early twenties to a distant relative, Fujiwara Nobutaka (藤原信孝). She married him in 998 in Kyoto. Fujiwara Nobutaka was as old as her father and was already married to other wives as well. In the following year, in 999, she gave birth to a daughter, Katako (片子), who would also be known as Daini no Sanmi (大弐の三位) later in life. Katako later grew up to be a poet who became famous on her own, independent of her mother’s fame. Murasaki’s husband passed away in 1001. 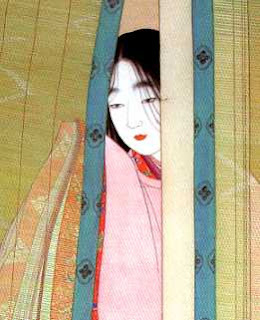 “The Tale of Genji” was said to have been begun after Murasaki’s husband’s death, when she stayed at home most of the time. 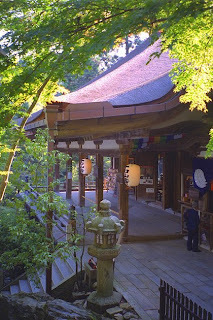 According to legend, it was said that Murasaki started writing this novel when she was in the Ishiyama Temple (石山寺) on the night of the full moon in August 1004. The Buddhist temple, which is currently in Otsu, Shiga Prefecture, Japan, is set on the side of a mountain and overlooks the magnificent Lake Biwa (琵琶湖). 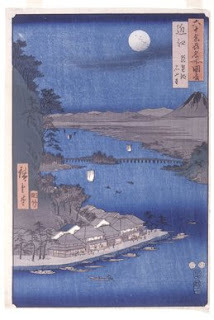 It is said in the legend that while Murasaki was sitting in the temple’s verandah, looking at the beautiful reflection of the full moon on the surface of the lake, she saw vivid images of many of the characters for her novel, including the smiling face of the main character, Hikaru Genji (光源氏). Those images, along with the marvelous beauty of the nighttime scenery, captivated her and inspired her to put them immediately into writing, hence commencing the first ever novel in the world. However, most of the story was written while she was serving in the imperial court. In 1006, she was called to serve Empress Akiko as lady-in-waiting in the imperial court because of her intelligence and her talent in story-telling and poetry. Murasaki frequently observed everything that was happening in the imperial court and she included some of the results of her observations in “The Tale of Genji.” It was from these observations that enabled her to proceed further in writing this novel until its completion. 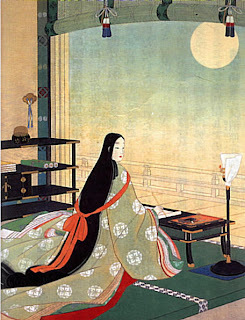 Many in the imperial palace enjoyed reading “The Tale of Genji” and it soon became a popular work of literature amongst the court ladies. They were greatly entertained by the novel and its plot, in which the theme of love and romance is presented in a manner which many of the court ladies deemed to be fantasy-like. Some of them even dreamed of living such a romantic life, as they found the hero of the story to be so perfect and amazing. Romance, adventure, travel and companionship, all packed in a single novel that was bound to make the greatest impression in Japanese literature – it was simply too much than what they could ever ask for, so they thought. Whilst serving as lady-in-waiting to Empress Akiko in the imperial court, Murasaki kept a diary in which she recorded all the events that occurred in the Japanese imperial palace and her daily life observations. The diary, known as the Murasaki Shikibu Nikki (紫式部日記), covered a period of 2 years, beginning from the autumn of 1008, when Empress Akiko was about to give birth, to the Japanese New Year festival in 1010. In it, Murasaki described many things about life and culture in the imperial court from her perspective, as well as her views about life itself. 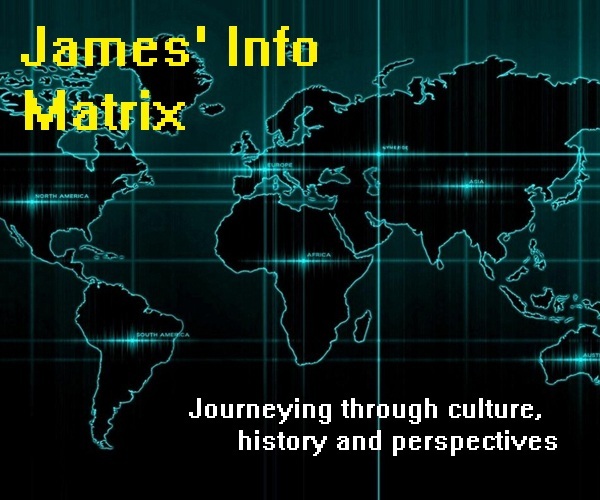 The year of Murasaki’s death is unclear, with some asserting that it was in 1014, while others say that it was in 1025. 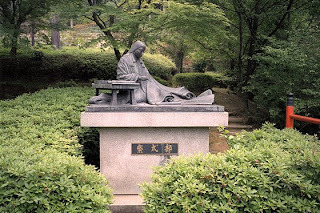 Nevertheless, one thing is absolutely clear – that Lady Murasaki Shikibu is one of the most prominent figures in Japanese literature and history, having written the first novel in the world, which would later become an indispensable part of Japanese literature and culture.